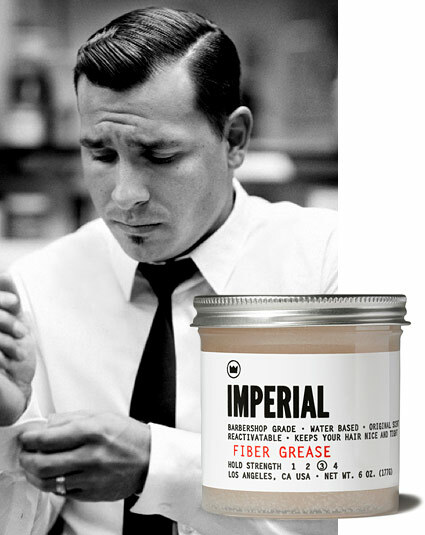 Imperial is a new line of products developed by a pair of barbers with a quarter-century's worth of experience. Made in America, in small batches, their Fiber Grease ($20) is dubbed an all-around utility finishing product that adds texture and won't dry into hair. The whole line of products has an old school feel, making them ideal for the throwback 'dos that are back in style these days. Opening the jar, we noticed the faint scent of melon—not cloying or girly sweet, but not the brute hair tonic smell we were anticipating. It's incredibly pliable and a little goes a long way. For a slicked back part, we warmed a small amount between our hands and worked it into damp hair and took a comb to it. The Fiber Grease works like a less-severe, water-based pomade. The first thing we noticed was a nice, healthy sheen to the hair thanks to addition of mica minerals. Unlike some heavy greases or waxy pomades, this didn't dramatically darken hair either. It gives some texture and allows the hair to still have some movement. Another advantage is that it can be reworked with wet hands—a bonus for those in hats or bike helmets. In short, if you're looking for a more classic cut, this is the product to finish it. Founders Pedro Zermeno and Scott Serrata field tested the line for two years in their barber chairs before launching Imperial.